After forty days of splitboarding in the Pyrenees, on one of the best winters I can recall, I wanted to feel the mountains in their purest state. I felt the need to push my snowboarding further and exploring other mountains I’ve always dreamed of, true big mountains. I’ve always dreamed about riding Peru’s Cordillera Blanca; finally, the time had come to do it. Being aware of the complicated climate there, I was sure that it was the right mountain range to set my first splitboard expedition, where I would attempt summiting a 6.000m (20.000 ft) peak to ride it back down. My plan was almost secret; I wanted it to be a solo expedition to live it my own way, with all the constraints and improvisation it would imply. I knew it was going to be a complicated mission, preparing and completing this adventure all by myself. Shaping the whole thing from Spain already made me a bit crazy, and I had second thoughts about being able to actually do it, how to carry all my gear or how altitude would affect me. I talked it over with friends and family and they all looked at me in a strange way, not encouraging me at all, bringing my self-confidence down – as if it hadn’t been low enough, already- but my thrill and my motivation remained intact. Just like that, I had bought my flight to Peru. 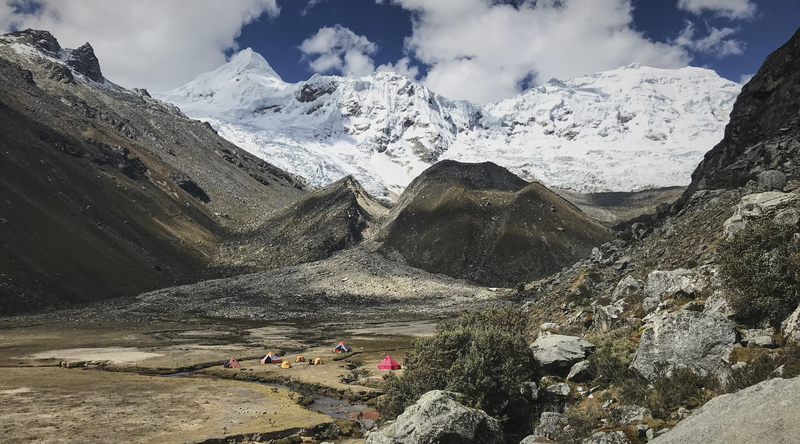 My drive to travel and ride in the Cordillera Blanca was still standing. 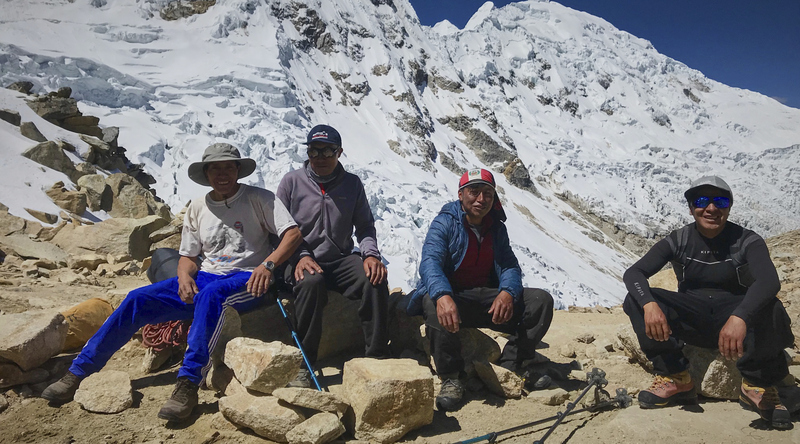 I contacted my friend Dani, a local guide and member of the mountain rescue crew in Cordillera Blanca Huaraz, an utmost experienced guy. The stories Dani told me on the camp were breathtaking and awakened me to the fact that these mountains allowed no margin of error. He would help me to carry on my ascent, but he didn’t want to hear about my descent. With 45 kg in my bags, I was headed to Huaraz, the base camp for the ascent. It was the most complicated luggage if ever packed for any of my trips. 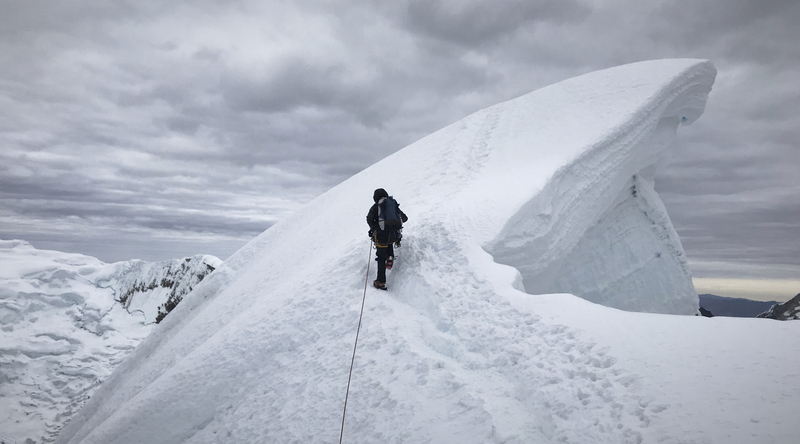 It was late July, which is usually the dry season in that region, but winter had been quite unsettled in Peru, and the forecast announced instability and precipitation for the following days, when I had planned to reach the summit. That’s when I start to question myself about acclimation, about starting the ascent or rather waiting for the storm to clear for more or less 12 days…But then again, I couldn’t wait for that long because I had to travel to Chile afterwards, and my economy was not exactly thriving, so I couldn’t afford to miss a plain. First setback. I spent two days acclimating, getting familiarized with this mind-blowing mountains at approximately 4.900 meters (16.000 ft), hiking up and down the hill and the lake. 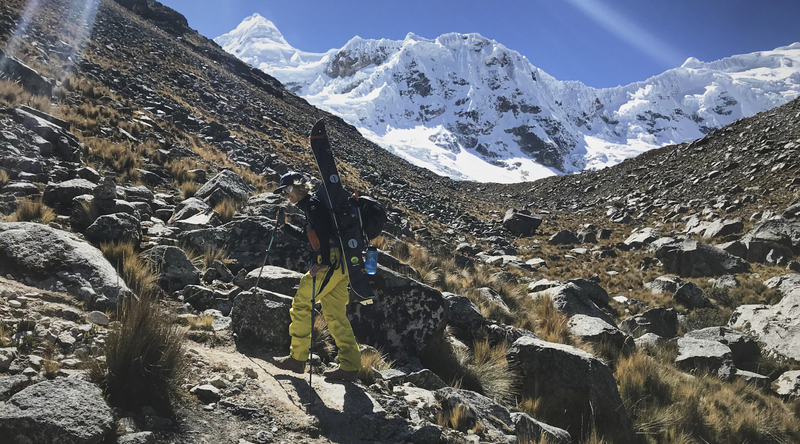 Each body needs a different period of time to acclimate, and mine would have required taking it easier and spending more time on the mountain before ascending to 6.000m (20.000 ft). That was the first lesson I learned for the next chapter: #6000split. 15 km of mostly flat terrain, with little vertical drop, allowing the donkeys to easily carry the gear and do their job, while I enjoyed the landscape and everything around me. 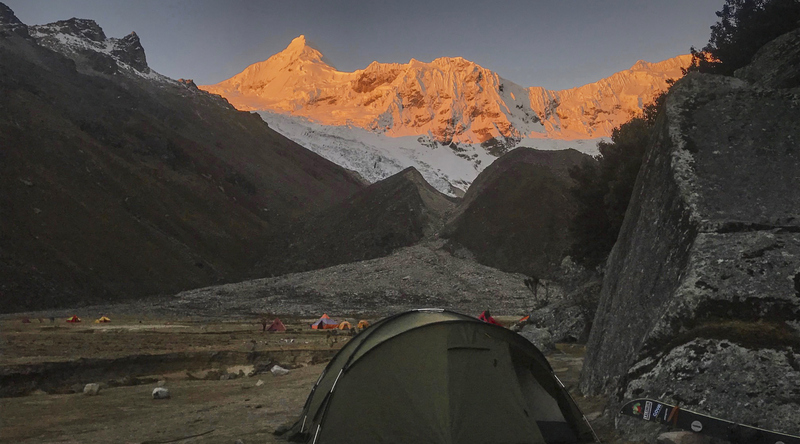 The view at the base camp was heart thumping: the sunset, the star-filled sky and the Tocllaraju peaking out from the background. I watched it feeling really small, with much respect and full of hesitation. Will my body agree to this quick acclimation? And the run down… what will the snow conditions be like? Will I have the strength to climb up the last two pitches after the long hike? I’ve drunk three liters of water and haven’t tinkled one bit… am I dehydrating? On camp 1, Dani and I established some locutories, signaled spots on the mountain with enough telephone range to make an emergency call in case of an accident. Dani curiously looked at my splitboard, showing it to the American expedition porters. They laughed and made jokes while we ate corn, and they taughted me words in Quechua. They treated me as one of them, they shared their food and their jokes with me, and they spoke in Quechua now and them so I wouldn’t understand what their conversation was about, but us women, we are wise and get a sense of EVERYTHING around us. I spent the night there, suffering from an intermittent headache. My body was telling me that I should have waited longer before attempting such an altitude. Whatever; I took an anti-inflammatory pill and went to sleep. We reached a rock balcony overlooking the glacier, the spot where we would be spending the night. What a place! Just being there made the trip totally worth it. Once the camp was set, I sat to observe the mountain in front of me, thinking about all the respect I would have to show it. I would choose the same route to ascend as to ride down: a safe, clean line. I sat there telling Dani about my plan until daylight faded away, giving way to complete darkness. Time to take a rest. Six hours later, we’d be up on our feet to start ascending. Obviously, I didn’t sleep a wink. The urge, the thrill and altitude sickness took over my sleep. I kept doing a mental checklist of my gear and planned a strategy while I tried to shut an eye. An 80 meter rope, ice-axes, crampons, skins, 5 snow screws, slings, 1 harness, 1 reverso, 7 tapes, 3 carabiners, 1 stake, food, 2 liters of water, batteries for the headlamp, and so on. At 1.30am the alarm clock went off. The idea was to ascend at night to climb the last two pitches in optimal ice conditions, as the temperature wasn’t too low. We hiked at night with headlamps lightening our steps, dodging multiple crevasses on the lower part of the glacier. I chose to carry my splitboard all the time. I felt faster and more comfortable teaming up with Dani on the rope. In complete darkness, Dani kept reading me his steps. He set, I cleaned, while he marked the most crucial descending steps where I had to pay extra attention. Thrilled and excited, we had reached the base of the last two pitches without taking a break; we were about to reach the summit of Tocllaraju. I decided that my splitboard better stay there, as we were about to face a serious, unridable ice wall. After securing my splitboard and readjusting my crampons, I started to climb through a bridge over a 15 m deep crevasse. The sun had come up and I was so focused I hadn’t even taken a break to enjoy it. The first step was complicated, as the wall was extremely exposed for a few meters. Right there, I thought I couldn’t make it any further. I wasn’t going to step foot on the summit because I wasn’t skilled or strong enough to overcome those meters, but in the end, we made it. We reached the summit, so we felt more relaxed, calm; we hugged and smiled. I was obviously impatient to ride back down, so we set the rappels to start descending. The stake we left on the summit was custom made by Dani’s smith due to the lack of equipment in the area, and the difficulty of obtaining all the necessary gear. But when I left, I let Dani a good assortment of equipment, for good measure. Once we’d rappelled down, I saw that my board was still there. For a moment I wondered if the harsh wind hadn’t dragged it somewhere else. After a 15-minute break to have a bite, I started to ride down on surprisingly good snow, a bit hard but enjoyable nevertheless. It is difficult to chain more than 5 turns after struggling your climb up all the way to 6.000m. I made several stops to fill my lungs and focus. Dani and I remained in visual contact all the time. A third person would have been ideal; being on your own on such a big mountain is pretty intimidating. The lower part of the glacier, which I had expected to be faster to ride, became a zig-zag through the crevasses. I had to step off the board on several occasions to be able to traverse them and feel I was going to set foot on solid snow, without running the risk of falling into one of them. The final slope of Tocllaraju was fast all the way to the Morrena camp (Camp 2 riding my board).At that point I tried to enjoy speed and ride leaving all the pressure behind, but my bad acclimation didn’t allow me to let my heart beat raise too much, reminding me of my weakness after the ascent and the descent. 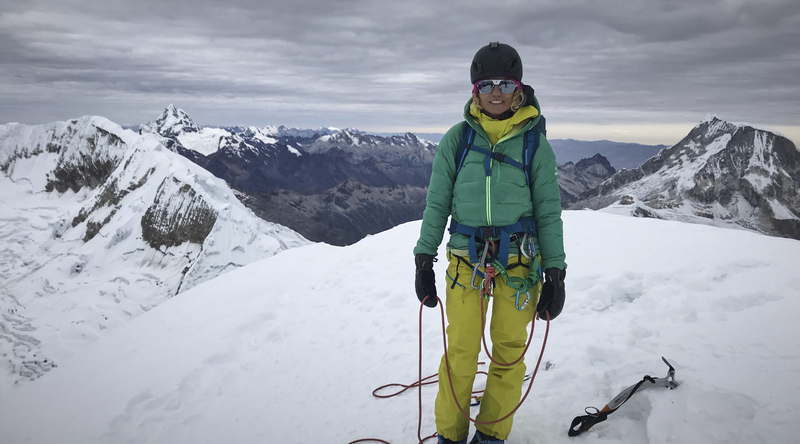 As soon as I arrived in the Morrena camp, I told Dani that after taking an hour break, I needed to head back down to Ishinca base camp for the night, because I wasn’t feeling too sound in high altitude. Altitude sickness was there to prove that I needed a longer acclimation period on my following expedition. I needed to dedicate the necessary time to that, no matter the unexpected events, the weather or any other circumstances. After a short break, I started to pack my camp when I realized my splitboard was gone! 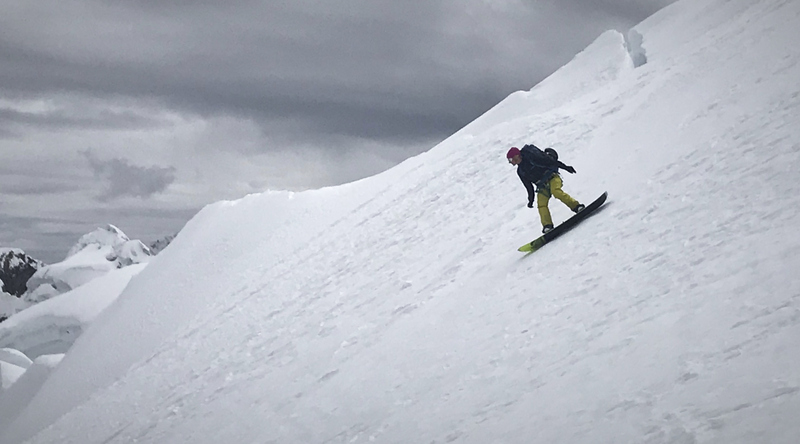 At first, I thought that a strong wind gust had taken my board flying down the ridge all the way to the glacier…considering our location on a rock balcony with a considerate vertical drop. While I kept guessing where my splitboard could be, Dani grinned and observed my moves. Ana: Dani, my board has flown down the cliff. Dani: Your board is already at the base camp. 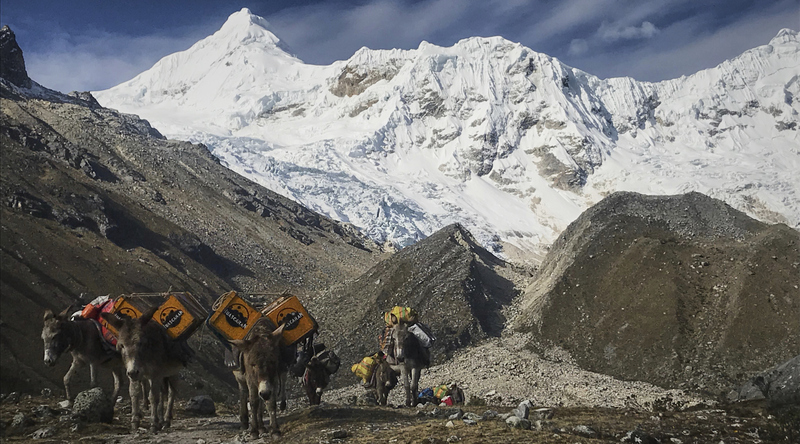 The porters of the North American expedition have carried down all your gear as a reward for reaching the summit, and the fact of you being the only person to conquer it today. Almost bursting in tears and moved by their generous gesture, I headed back down to base camp 1 with Dani. 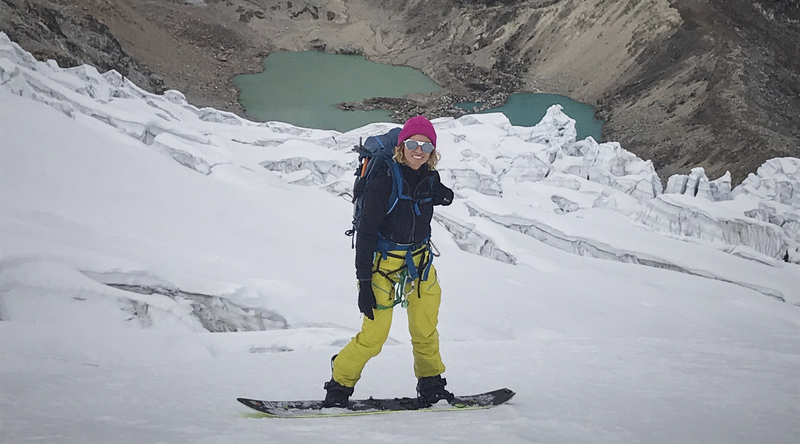 I was thrilled; it had been an amazing experience of learning, hardening my skin, sharing, inspiring my snowboard career and proving myself that the expedition, which kept turning in my head and made me hesitate, was certainly possible. Every time I speak about Tocllaraju I get the shivers. I’m sure that I’ll remember it all my life. The feeling of being 2 days away from my hostel, lost in the mountains with my splitboard, calculating what I need to drink every day and melting snow accordingly, carrying it along the food and gear I need for the next camp, has been a pure experience. Thinking about it, the thrill of a good result in a contest would last about 48 hours. As of now, this has been the most rewarding and authentic experience snowboarding has given me. Now, #6000split is my new project and I know it is possible. So I’ll go back to these mountains, stronger and dedicating time to a better acclimatization. Things need their time, and there’s a time for everything. It’s time to ride bigger mountains, to keep learning and dreaming with #6000split.